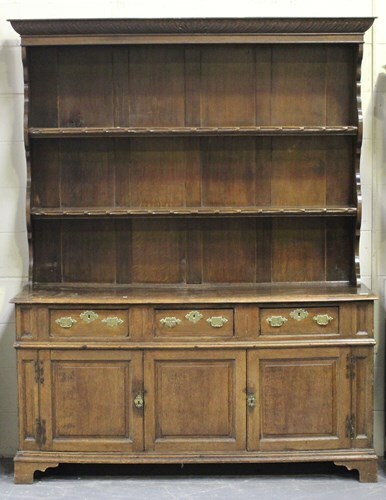 An 18th century and later oak dresser, the shelf back above three frieze drawers with brass plate handles, the central panel flanked by two doors, on bracket feet, height 88cm, width 169.5cm, depth 48.5cm (alterations). 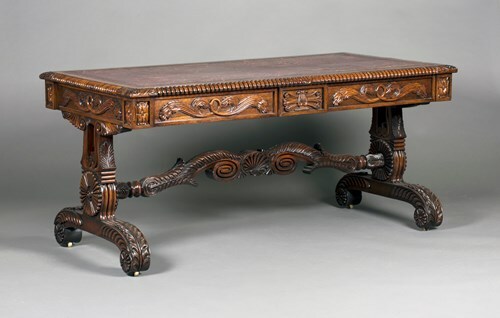 A William IV rosewood library table, in the manner of Gillows, the top inset with gilt-tooled red leather within a heavily reeded edge, the carved foliate frieze fitted with three drawers, raised on a pair of ornate lyre supports carved with acanthus leaves and rosettes, the scrolling bracket feet similarly decorated and united by a carved stretcher, height 73cm, length 158cm, depth 83cm. 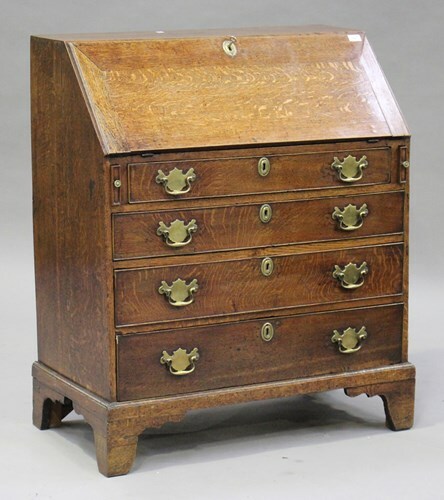 A George III oak bureau, the fall front revealing a fitted interior above four graduated long drawers, on bracket feet, height 107cm, width 93cm, depth 48cm. 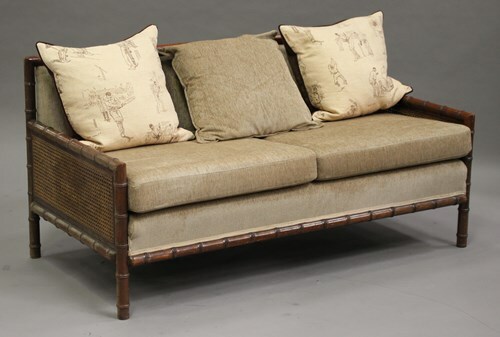 An early 20th century mahogany framed faux bamboo two-seat bergère settee, upholstered in taupe fabric, height 77cm, width 151cm, depth 75cm. 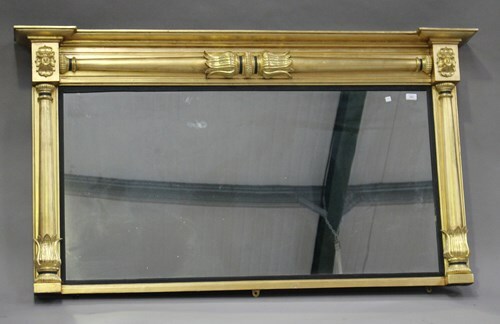 A 19th century giltwood overmantel mirror, the inverted breakfront pediment above tapering column surrounds with carved cusp terminals and rosettes, 93cm x 169cm. 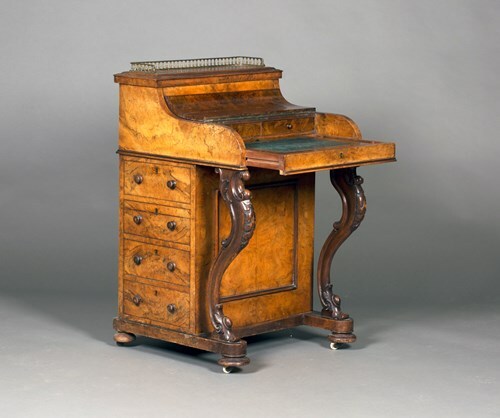 A mid-Victorian walnut piano-top Davenport, the pop-up top above a hinged serpentine lid revealing a pull-out writing surface, the side fitted with four drawers, raised on carved scroll supports and bun feet, height 93cm, width 57cm, depth 57cm. 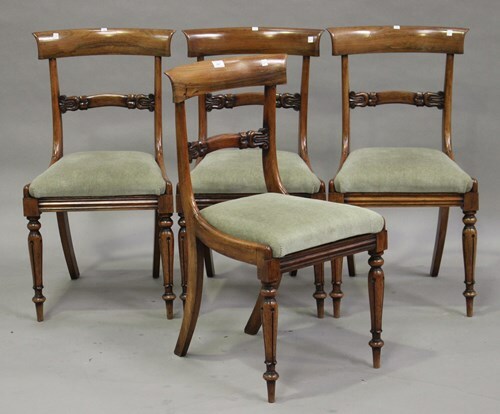 A set of four William IV rosewood bar back dining chairs with carved foliate centre rails, the drop-in seats raised on turned tulip cusp legs, height 86cm, width 46cm. 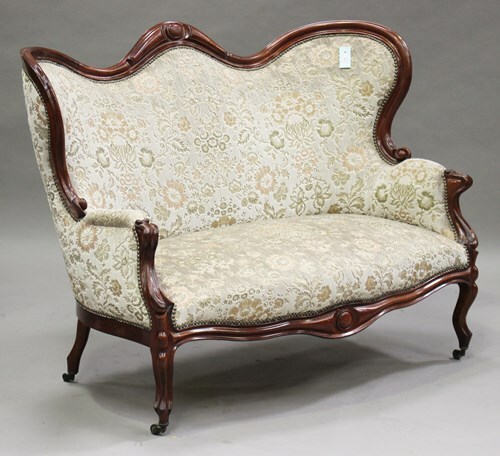 A mid-20th century walnut framed three-piece bergère suite, comprising a settee and two armchairs, all raised on carved cabriole legs and claw and ball feet, height 82cm, width 156cm, depth 84cm. 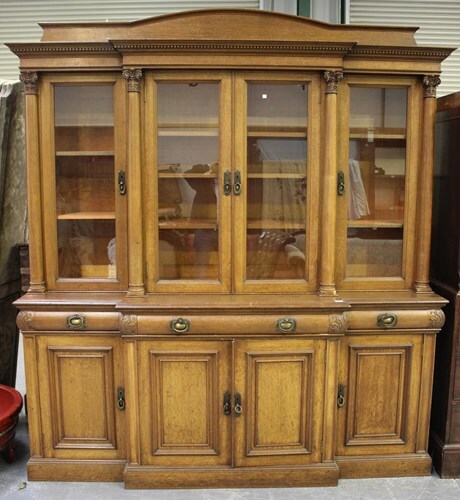 An early 20th century oak breakfront bookcase cabinet, the arched frieze back panel above a dentil moulded pediment and four glazed doors, flanked by finely carved Corinthian columns, the base fitted with three drawers above panelled cupboard doors, raised on a plinth base, height 243cm, width 219cm, depth 57cm. 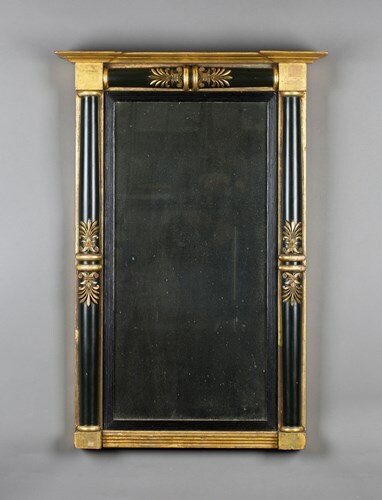 A Regency ebonized and giltwood pier mirror, the frame with ebonized pilasters and applied palmette sprays, 90cm x 61cm. 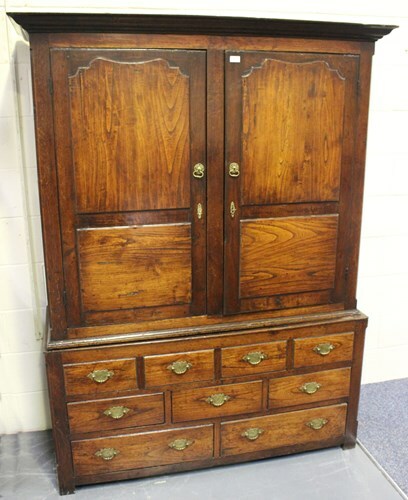 An 18th century provincial elm livery cupboard, the moulded pediment above a pair of panelled doors, the base fitted with five drawers and four dummy drawers, on stile supports, height 195cm, width 147cm, depth 55cm. 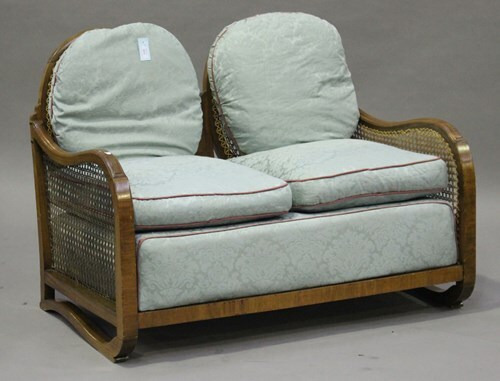 An Art Deco walnut framed three-piece bergère suite, the arched backs above removable cushions, on shaped supports, comprising a settee, height 86cm, width 119cm, depth 77cm, and two armchairs, height 86cm, width 60cm, depth 77cm. 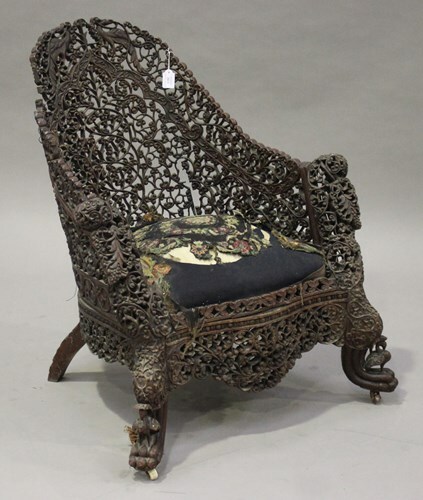 A 19th century Burmese carved hardwood tub back armchair, profusely pierced with overall foliage and openwork handrests, raised on shaped feet, height 91cm, width 78cm (faults). 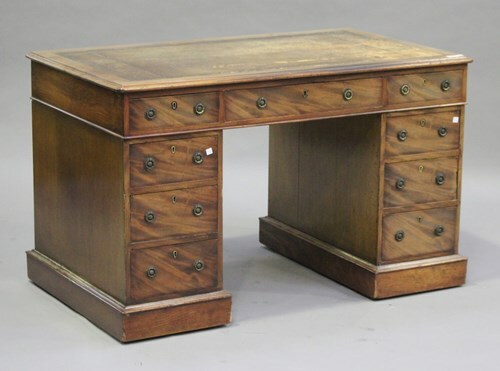 An early Victorian figured mahogany twin pedestal desk, the moulded top with a brown leather writing surface above nine drawers, raised on plinth bases, height 73cm, width 121cm, depth 72cm. 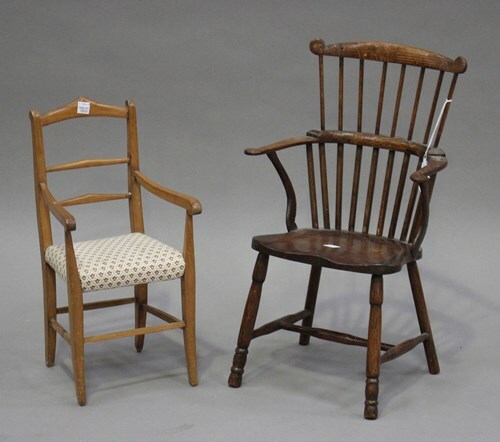 A 20th century oak miniature Windsor armchair with spindle back and solid seat, height 46cm, width 28cm, together with another doll's chair. 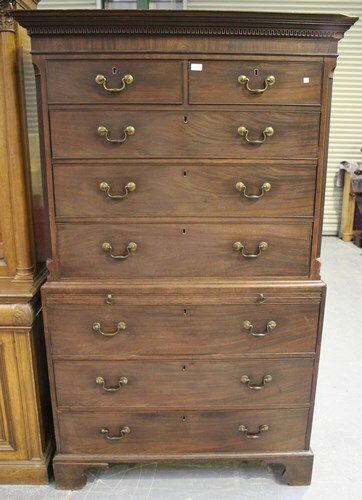 A George III mahogany chest-on-chest, the moulded pediment above two short and three long drawers, the base fitted with a brushing slide and three long drawers, on bracket feet, height 197cm, width 122cm, depth 59cm (some faults). 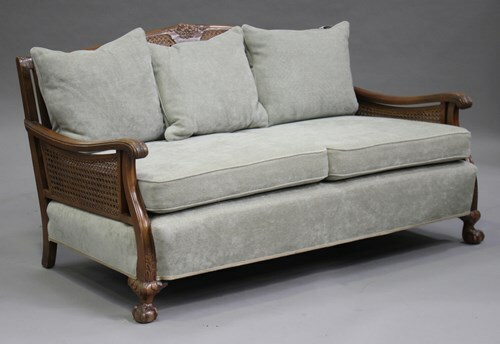 A late 19th century mahogany showframe settee with carved decoration, upholstered in green floral velour, raised on cabriole legs and castors, height 103cm, width 135cm. 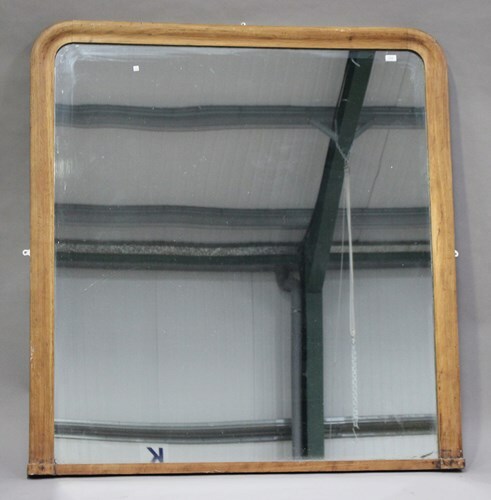 A large late Victorian stripped walnut arch framed overmantel mirror, 161cm x 151cm. 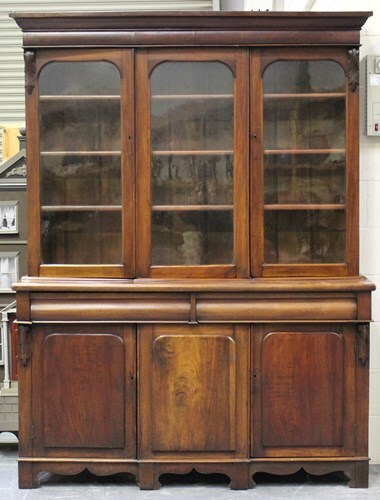 A mid-Victorian mahogany bookcase cabinet, the moulded pediment above three arch glazed doors, the base fitted with drawers above cupboards, on bracket feet, height 212cm, width 161cm, depth 49cm. 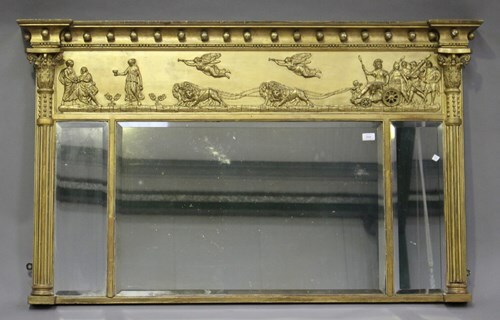 A 19th century giltwood and gesso triple section overmantel mirror, the ballshot mounted pediment above a frieze of lion-drawn chariot and classical figures, the bevelled plates flanked by cluster column pilasters, 91cm x 150cm.